Taiwan women's NT lost to Japan 67-58 Tuesday and dropped to 1-2 in the preliminary round of the Asian Championship for Women. Taiwan fell behind early after Japan's 18-0 run in the first quarter. Trailing by as many as 19, Taiwan head coach Hung Ling-yao sent her second unit into the game. Taiwan managed to cut the deficit to five, 62-57, but could never got closer than that. 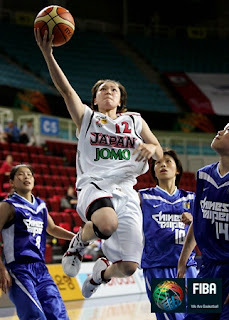 Yuko Oga paced Japan, which was 3-0, with 20 points and 7 rebounds. Noriko Sakakibara had 15 points. Japan controlled the boards, leading 51-36. Point guard Wen Chi had a team-high 14 points for Taiwan. Liu Chun-yi had 10 points. As Taiwan will probably finishes in the 4th place in the preliminary, its opponent in the semifinals could be wither Japan or South Korea, which is also 3-0 currently. China is 2-1.